The Kris Bryant Era is here. Touted by many as baseball's next big thing, he is getting the Chicago Cubs faithful excited for the future. And that future might not be far away. And while collectors had to wait a bit longer for official base set rookie cards, lots of Kris Bryant cards debuted before his first official game with the Cubs. The second overall pick in the 2013 MLB Draft, he got off to a great start in A-ball. Following the season, Bryant proceeded to tear up the Arizona Fall League where he hit .364 with six home runs in 20 games -- good enough for AFL MVP honors. There is no shortage of Kris Bryant cards. A big part of this comes from the fact that he played for USA Baseball, which means lots of appearances in Panini sets. Bryant has also been featured in recent sets from Leaf and Topps. 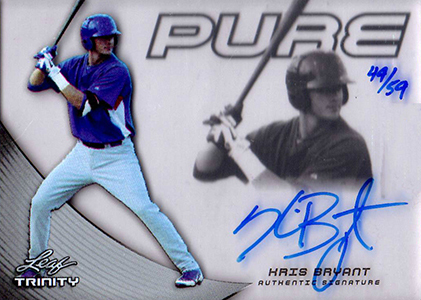 The first Kris Bryant cards came out in 2012. 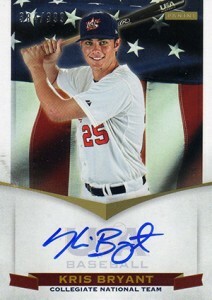 The 2012 Panini USA Baseball box set has a bunch of options, including autographs and memorabilia cards. 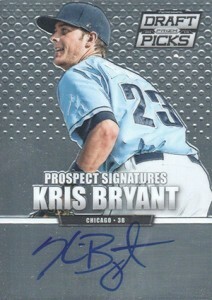 Bryant also has an autographed jersey card in 2012 Playoff Prime Cuts. 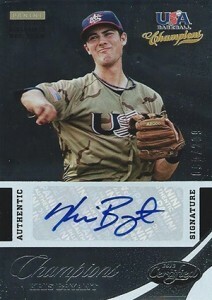 The floodgates opened in 2013 as the USA Baseball cards continued as well as the first Kris Bryant cards featuring him as a pro. Many collectors were disappointed to see that the hard-hitting third baseman wasn't a major part of 2013 Bowman Draft Picks & Prospects. 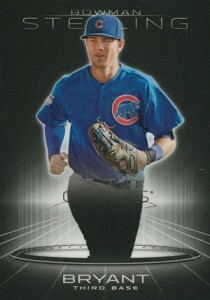 He does have a couple of cards in the set -- his first in a Cubs uniform -- but not a Bowman Chrome Autograph. Those came with the release of 2014 Bowman Baseball. 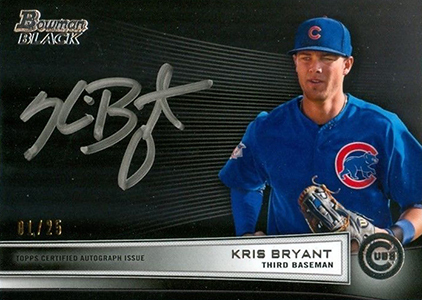 Bryant has become a centerpiece of many of the year's 2014 Bowman products, including several autographs. Among them is the "missing" 2013 Bowman Chrome Draft Autograph, which surfaced in 2014 Bowman Inception Baseball. These 2013 autographs have also been inserted in 2014 Bowman Platinum and 2014 Bowman Chrome. 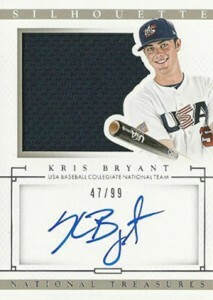 Below is a detailed look at some of the top Kris Bryant cards released before his MLB debut. Please note that this is not a definitive list of Kris Bryant prospect cards. Rather, it's highlights of some of his most popular and more readily available cards. Click on card names or images to shop for singles on eBay. 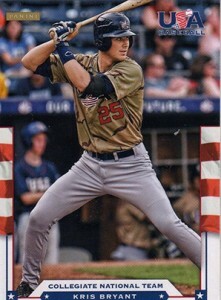 Part of the 2012 Panini USA Baseball box set, this might not rank as one of the most valuable Kris Bryant cards but it is his first base card. This should make it affordable over the long-term. That said, not a lot of these sets are broken down for base singles so they're not the easiest cards to find either. 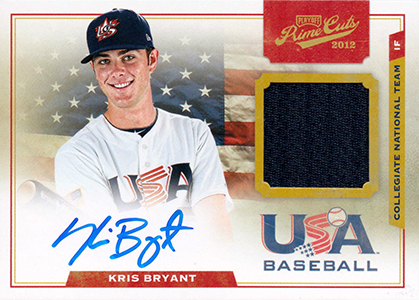 One of the many premium inserts in the 2012 Panini USA Baseball box set, this Kris Bryant autograph benefits from an on-card signature. The numbering to 399 means that it pops up with regular frequency. This could be an attractive option in the years to come for those wanting an attractive Kris Bryant certified autograph without having a huge budget. Another premium box set offering, this card comes with two jersey swatches. The sticker autograph takes away some of the desirability but it still has an attractive design. 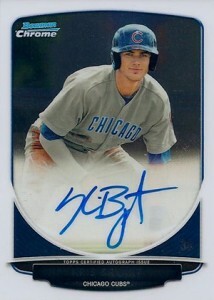 With both an on-card autograph and a jersey swatch, this is one of the stronger Kris Bryant prospect cards. In fact, the design is a lot better than many of the major league rookies found in the same release. Although Topps didn't include Kris Bryant in the main 2013 Bowman Chrome Draft Prospect Autographs lineup, he does have a couple of signed cards in the set. The Bowman Black autograph is numbered to just 25 copies. As one of the first cards to feature the highly touted prospect in a Cubs uniform, it's long-term outlook is very strong -- for those that can find and afford one. 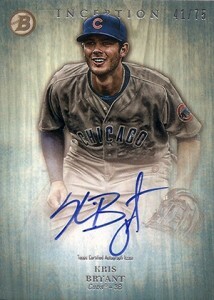 Topps did another Bowman Black Kris Bryant autograph that was included in 2014 Bowman Inception. This one pictures him batting. Bowman AFLAC Autographs have been popular for a long time. 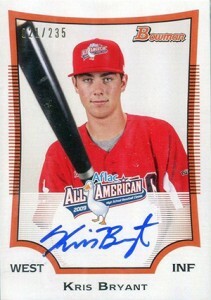 Produced, printed and signed back at the 2009 AFLAC All-American game, it is notable for having a very early Kris Bryant signature. Even now, there's a noticeable difference in the quality. If history proves true once again, there's a solid chance that Bryant's signature will further suffer as he signs more in the years ahead. Like all AFLAC cards, there are a couple of different variations. Certified pack-issued cards are serial numbered. Unnumbered copies were also given out at the game. These can be found signed and unsigned. If you're going after an autographed version that isn't serial numbered, it is highly recommended that you go with professionally authenticated versions. 2014 Bowman might take the credit for being Bryant's first Bowman card, but 2013 Bowman Sterling has his first non-autographed card in a Cubs uniform. With base cards and basic Prospect inserts relatively rare in the autograph-heavy product, this isn't the easiest card to find. 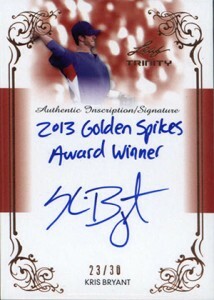 It's should definitely be a top pick for collectors who might not be able to afford a Kris Bryant autograph. Mixing the past and the future, the 2013 Leaf Memories Kris Bryant autograph is inspired by the 1990 Leaf Baseball design. The on-card signature is another big selling point. It also has several parallels numbered between 50 and 1. 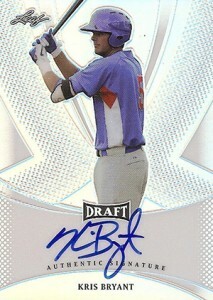 Another overlooked early Kris Bryant card, 2013 Leaf Metal Draft comes with a sharp Prismatic (or Refractor) look. It's also hard-signed. In typical chromium fashion, collectors can also hunt for colorful parallels. Not only does this card give you an early Kris Bryant autograph, but it comes with a neat little note. Most inscriptions focus on his early accomplishments and being excited to be drafted by the Cubs. The patch might not be game-worn, but it looks pretty sweet nonetheless. The base version of the card has a confirmed print run of just four copies, so parallels might be the route to go (although they're pretty scarce too). Images don't do these cards justice. You need to see them in person to notice the multiple layers the images have. The clear background makes the signature pop as well. 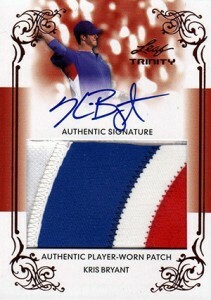 This is certainly one of the most visually pleasing early Kris Bryant autographs. While Topps didn't include a Kris Bryant Chrome card in 2013 Bowman Draft, Panini went there with their similarly themed 2013 Panini Prizm Perennial Draft Picks. While the set name may be a little difficult to make sense of, the headliner's inclusion isn't. Like all Prizm sets, a rainbow of parallels can also be found. The chromium-style card comes with an on-card autograph. Until Bryant gets a Bowman Chrome autograph, this might be one of the next best things. Over time, it's unlikely it'll be as valuable as its Bowman Chrome counterpart, but it is available now for those looking for a solid value. Certified is a name familiar to a lot of long-time collectors. Besides the trademark foil stock, the card is also highlighted by multiple colored parallels. The sticker signature is somewhat less desirable, but it's still a solid card for those who like the foil style. 2013 Panini USA Baseball Champions is also proving to be a cheap box break with some solid upside. As the first Kris Bryant Bowman Chrome card, this one will carry a lot of recognition over time. 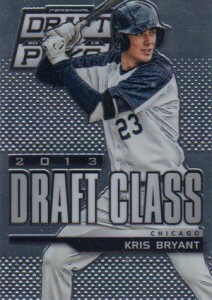 Base versions should remain largely affordable, especially with Bryant appearing in 2013 Bowman Sterling. It comes with lots of Refractor parallels to provide ample rarities. 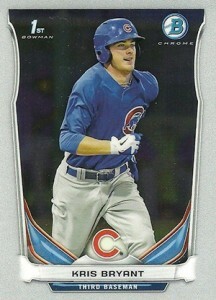 Inserted as a redemption, this is likely to be Kris Bryant's most popular card. The final card comes with an on-card autograph and it has several Refractor versions. Although it's an insert and not a rookie in the traditional sense, this is the card a lot of people will look to over time. In addition to landing in 2014 Bowman Baseball, the same card was also included in 2014 Bowman Chrome Baseball. 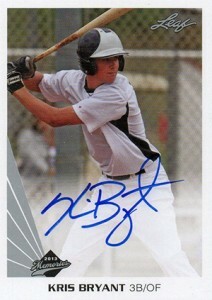 It doesn't look as though Bryant has a base version of his Inception autograph. Rather, his most plentiful card is a parallel numbered to 75. It has an on-card signature and a distinct design. It's also appealing to some as it's not as pricey as his Bowman Chrome card. 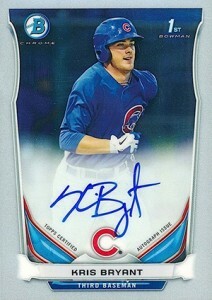 Bryant has several other autographs in Bowman Inception as well. This card is a little curious. Intended for release in 2013 Bowman Chrome Draft, it never appeared. The base version finally showed up in boxes of 2014 Bowman Inception, 2014 Bowman Platinum and 2014 Bowman Chrome. It goes head-to-head in popularity with the 2014 Bowman Chrome Prospect Autograph. The one-of-one Superfractor was found and is slated for a repackage product from Prospect Rush. National Treasures represents the top of Panini's high-end scale. Silhouettes is one of their most popular lines of autographed memorabilia cards. Combine the two and you've got one of the most attractive early Kris Bryant cards. 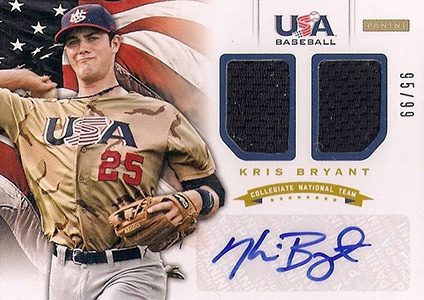 It comes with both an over-sized swatch from a game-used USA Baseball jersey and an on-card signature. The base version has plain swatches but parallels can lead to some strong patch pieces. Bryant has a couple of other cards in 2014 National Treasures that are also popular. His Made in the USA Autograph comes with a manufactured USA flag patch. There's also a die-cut autograph card that is in the shape of a baseball on one side. Both are numbered to 99. 2015 Topps #616 Kris Bryant ROOKIE BECKETT 10 MINT Chicago Cubs ! Was lucky enough to find Bryant’s 1:1 superafractor in bowman sterling, and I am a Cardinals fan. Where is the karma in that?? I’m down to trade every cardinals card I have for the sterling super! Unless its been sold on eBay already? And karma has nothing to do with pulling a cubs card when your a cardinals fan…it’s just luck of the draw! Unless you work for topps and the card went out the backdoor! I’m just glad to own one of the base trinity patches! I will still stand behind that product as being very underrated however it is picking up steam. The product has probably the best collection of the next best players in baseball however it’s a shame that this years product was proven that they just had the players put on jerseys for a second and then added high schoolers too the pure cards! Plus added more cases! And as I’m trying to complete the pure set from ’13….I’m getting sick of seeing the pure cards in everything(exaggeration) leaf is making. I think the original pures were a great idea but don’t over do it like 80 colors of every player in Bowman products! It’s just flooding the market while making the product less attractive, IMO. Ie leaf Q!